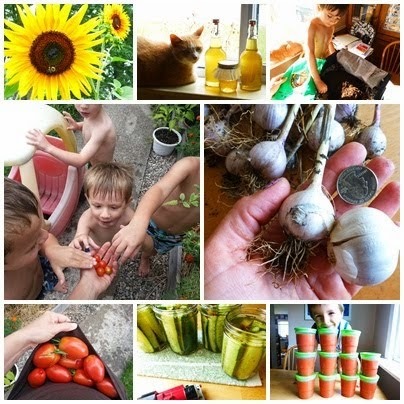 little*big*harvest: Fermenting and Salt: Why, What Kind, and How Much? Fermenting and Salt: Why, What Kind, and How Much? I know I got several friends and readers excited when I posted my FermenTroduction a few weeks ago. My enthusiasm for this new project is through the roof! Having fermented foods available for daily nibbles has become a new goal for me; even just a bite or two each day will keep the good bacteria (probiotics) going strong in my digestive track. There are so many recipes, variations on recipes, and techniques out there, that I don't think I will ever get bored of finding ways to get probiotics into my belly (and into the bellies of my family)! This post is for you guys, my friends and readers...our first lesson, together. It's all about SALT. Salt is arguably the most important ingredient you will need to ferment your veggies. You don't need salt for all ferments. Yogurt? nope. Kombucha or water kefir? nope...well not unless you are wanting to add some minerals to your water, but I'll save that for another post. Veggies? YEP. Since I'm diving into the world of veggie ferments, I thought maybe I really ought to figure out the salt thing. super simple and delicious recipe; post coming soon! Salt keeps the bad guys away. The bacteria that we want in our fermenting veggies is called lactic acid bacteria. "Lacto-fermentation" is named for the lactic acid bacteria it cultivates. Shortened to LAB in many articles about fermenting, Lactic Acid Bacteria is actually a family of bacteria, all of them helpful to our guts. LAB are on the surfaces of almost everything in our environment, and are some of the first bacteria we ingested as newborn babies. How cool is it that our symbiotic relationship with these good guys go all the way back to the beginning of our lives?! They help us fight off infections and digest our food. These miraculous little lactic-acid-good-guys are what we WANT in our ferments, and they are not really bothered by certain levels of salt or acidity. Other types of bacteria and molds that we DON'T WANT, and that are harmful to us, are inhibited by salt. By giving your veggie ferments a salty bath to sit in, you ensure that the bad guys are not taking over, and the good lactic acid bacteria are allowed to proliferate. Salt pulls water out of the veggies and helps create the brine needed. In some ferments, adding salt and massaging the veggies (think shreds of cabbage destined to become sauerkraut) is all that is needed to make enough brine to cover the veggies. The brine, whether extracted from the veggies themselves or created with water, is very important for keeping oxygen out, because oxygen is another way that the bad bacteria can try to take over. Some veggies are not as conducive to the massage treatment (think hard carrot sticks) and will need a brine of water and salt prepared separately and poured over them. Salt helps keep a lovely crisp crunch in your fermented veggies. There is a substance called pectin contained in the cell walls of veggies that keeps them firm and crisp. Enzymes can quickly eat away at the pectins, making the veggies mushy--unless salt is there to slow them down. Fermented veggies usually keep a nice crunch, even after months, because those pectins have been protected and preserved. Salt allows you to preserve your ferments longer. The fermentation process is actually slowed down by the salt; lactic acid bacteria are given a perfect environment to live and reproduce in, while the pectin digesting enzymes are slowed, and the development of surface molds is halted or at least greatly reduced. *That being said, molds can and will sometimes form on the top of your ferments. Enter one of the big debates in the world of fermenting; Do you scrape the mold off and eat the ferment, or throw the whole batch out? Some sources swear that the ferment under the mold is fine, and other sources say the molds have roots deep down in the ferment, and that the batch should always be tossed. For now, I'm going with as safe as possible; if I see mold on my ferments even after using salt properly, I'm probably going to toss the whole thing into the compost. Not all salts are created equally! but sea salts contain tons of minerals. Avoid processed salt with added iodine. That's really the bottom line, right there. Processed table salt has been messed with and adulterated too much to be a good choice for fermenting. The minerals have been stripped out, anti-caking agents added, and then usually iodine is added to replace what was stripped out. Interestingly, salt contains iodine naturally when it's pure, and when it's present naturally it doesn't inhibit the ferment. Iodine added later, however, can harm the good bacteria present in your ferment and slow it down to the point of being ineffective. Canning salt or kosher salt are a couple choices you can use for ferments, and they are available just about anywhere. They do not contain iodine and generally do not have any other additions like anti-caking agents. Sea salt is arguably the best choice. I have found a variety of sea salts available both at grocery stores and online. The big advantage to using an unrefined sea salt is the hefty mineral content it contains. Since one of the reasons you are likely fermenting is to gain nutrition, using a salt that will enhance the fermented veggies with minerals--made even more available to your body through the fermentation process--only makes sense. in grinders for a great price, if you have one near you. According to some sources, including Sandor Katz--who probably knows more about the ins and outs of fermenting than anyone alive (or at least, has written most comprehensively about it)--salt is not intrinsically necessary. When curing meats, or fermenting years-long ferments like miso, then salt and its precise measurement is absolutely crucial for safety reasons. Some traditional ferments, however, like Himalayan gundruk and sinki, don't use salt at all. Katz does go on to state, however, that even if salt isn't crucial for safety of veggies, it is very important for preservability, taste, and ultimately, for a successful ferment without much hassle. More advanced fermenters might want to experiment with short ferments using no salt or using whey to jumpstart beneficial bacteria production, but for me, a relative newbie, I say why mess around when salt is proven to be extremely helpful? Fermenting For Dummies includes salt as one of their Essentials, right up there with water and containers. Even though I wanted to point out that technically and historically salt is not always used (but this is yet another debate within the ferment community), when it comes to the common home fermenter, and especially us beginners, I'd argue that salt IS crucial for all ferments. Too little salt will not inhibit the bad microbes effectively, and too much salt will kill off the LAB you are trying to cultivate (and thus leaving you with salt-cured veggies, not fermented veggies). Follow a proven recipe. As a beginner, ferment recipes are a huge help! I noticed that when I started collecting recipes online and in books, the salt amount varied depending on the recipe. Because fermenting veggies is really a process, with many variables, recipes can become unnecessary once you understand the role of salt and you may want to experiment at that point. Make a Basic Brine. If you decide to forgo a recipe, fermenting truly IS AS SIMPLE as covering veggies in a brine. The salt-water brine, as stated above, serves several purposed for your ferment. Deciding on the percentage of the brine (how much salt per cup or quart of water) is the key. This link at cultures for health gives some of the variables to think about when choosing a brine. You can choose anywhere from a 2% brine to a 5% brine, which measurements below. Experimenting with the amounts according to taste and what you are fermenting will just come with time. When measuring salt, keep in mind that depending on how finely or coursely ground the salt is, a Tablespoon can weigh different amounts. Some fermenters weigh their salt using a digital kitchen scale (This is the one I own and love ). Though I have a scale, I don't weigh the salt; I simply use finely ground salt and measure it with measuring spoons as directed by whatever recipe I am following. *Note: If massaging the veggies to make brine without added water, you will not use as much salt per quart. For example, a general guide for kraut is 1 Tablespoon salt per 2 pounds cabbage (which is usually the amount that fits into a quart jar). Use a guide for the right amount of salt. If you want to start experimenting without proven recipes, there are many guides and charts available online that will help lead you to the right amount of salt in your ferments. The salt included with a tool kit from Fermentools.com has a guide printed right on the package. Some experienced fermenters swear by going by taste. For example, when making kraut, Sandor Katz says to sprinkle salt over the cabbage and start working it, tasting the resulting brine to see if it's 'pleasantly salty'. For us newbies, 'pleasantly salty' could mean many different things! In my upcoming kraut post I will give a tip on how to taste for salt, but my advice for all of us ferment newcomers is to follow a recipe or guide until we know how to taste for salt. they also offer fine Himalayan salt. Now that you know some of the reasons why salt is important, I hope you'll venture a recipe! Perhaps you've already started? I'd love to hear about your current or hopeful projects in the comments. I've got a few good projects going right now that I can't wait to share with you. Though I'm not an affiliate, I can't say enough about the tools I've been testing for Fermentools.com (they are pictured above). Tools are not necessary (just a crock or jar with a lid will do), but I personally have found the prospect of fermenting much less intimidating when I have some good tools to ensure I'm doing it correctly! Be sure to check out their site if you've wanted to look into some tools to get you going; it's a great company. Pickling is fermenting, right? For years I saw my paternal grandmother and aunts use regular table salt for pickling and scratching their heads why do cucumbers turn into a slime after a week or two. Then my mom and my maternal grandmother revealed the secret to a long lasting crisp pickles: rock salt. That was the only bit of pantry item I could fit into our bursting suitcases when returning from our trip to Turkey. Salt makes a huge difference! Yes, pickling in brine (not using vinegar) is fermenting! I've read things you've written about pickling (and I also fermented some green tomatoes after you gave me the idea). I bet the table salt your grandma and aunts were using contained iodine and that's what was giving them issues. I'm really glad your other side of the family set them straight, ha! I love all this great information... Thank you! I was always curious about what type of salt to use for fermenting. I love that sea salt is best because I always try to use pink Himalayan sea salt whenever possible! Great info, Andrea! Thanks for coming by, Caitlin! We also use Himalayan sea salt; we recently got a Costco in our city and they carry it it (score!). We use it pretty much exclusively!